The nerve that is associated with anterior tarsal tunnel syndrome is the peroneal nerve that runs from the front part of the leg down across the ankle going to the top of the foot. This nerve contains motor (muscle) and sensory (feeling) branches. It provides a motor activity to the small muscle on the outside of the foot. It provides sensation to an area between the first and the second toes and small sensory branches to the joints in the back part of the foot. This nerve may be entrapped by ligament-like structures (retinaculum) that cover the muscles on the front part of the ankle and top of the foot. Tendinitis causing inflammation of the tendons. Abnormal bony prominences on the top of the foot or front part of the ankle that may be congenital in nature. The abnormal bony prominence that is caused by fractures or arthritis. Space-occupying lesions including ganglions and tumors. Excessive shoe pressure causing nerve compression. Numbness and tingling across the top of the foot going into space between the first and the second toe. 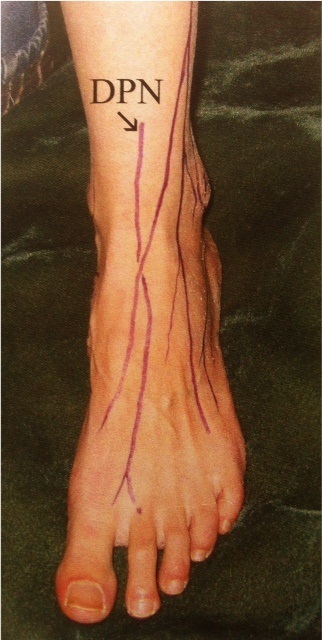 When tapping the nerve at the area of entrapment causes a shooting pain into the first and second toe area. Possible soft tissue swelling in the front part of the ankle or top of the foot. Firm palpable bone over the area of maximum tenderness and shooting pain. May be associated with lumbosacral root lesions. Atrophy or wasting of the muscle on the outside of the foot, especially when comparing it to the unaffected side. Nerve conduction velocity and EMG studies may help to determine the location of the entrapment and degree of injury to the nerve. X-rays are necessary to rule out any bony injuries that could contribute to the nerve compression. MRIs may be needed to rule out any space occupying problems that could contribute to the nerve compression. Identify the primary cause of the problem. A tight shoe is aggravating the condition. A loose shoe or a shoe that does not touch the front part of the ankle or top of the foot may be of immediate benefit. Changing how one lace up their shoes may also provide immediate benefit. If blunt trauma occurred to the nerve it will take months for the condition to resolve. If inflammation of the tendons exists, anti-inflammatories or a cortisone injection may help to reduce the inflammation to the region. If space-occupying lesions are present they may need to be addressed either by aspiration of a ganglion cyst or surgical removal of any mass that is not amenable to conservative care. Abnormal bone or bone spurs usually need to be removed in order to decompress the area. If facial structures are the primary cause and conservative treatment fails surgical release of the tight ligaments will immediately decompress the nerve. If advanced changes have not taken place in the nerve then surgically releasing the ligament will provide almost immediate relief. Excellent with any of the previous treatment options if the nerve has not been compressed for a long period of time and significant changes have not occurred internally to the nerve itself. 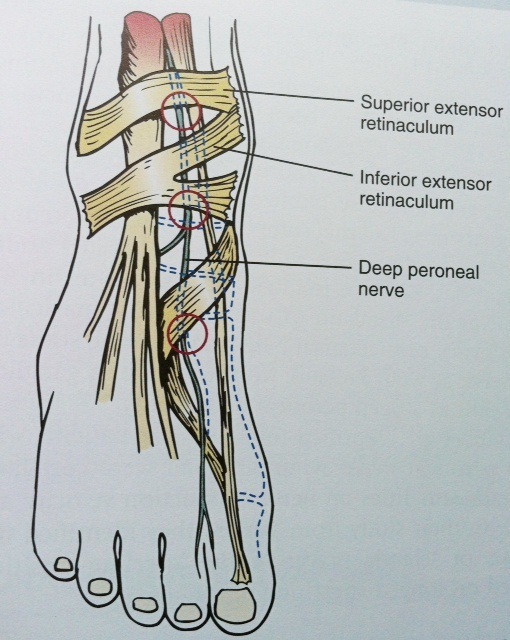 Below is a diagram of the anatomy of the front of the ankle and top of the foot where the three most common locations of compression of the Deep Peroneal nerve are seen indicated by the red circles. These are also areas where soft tissue bands called retinaculum are seen which serve a mechanical purpose in the movement of tendons.